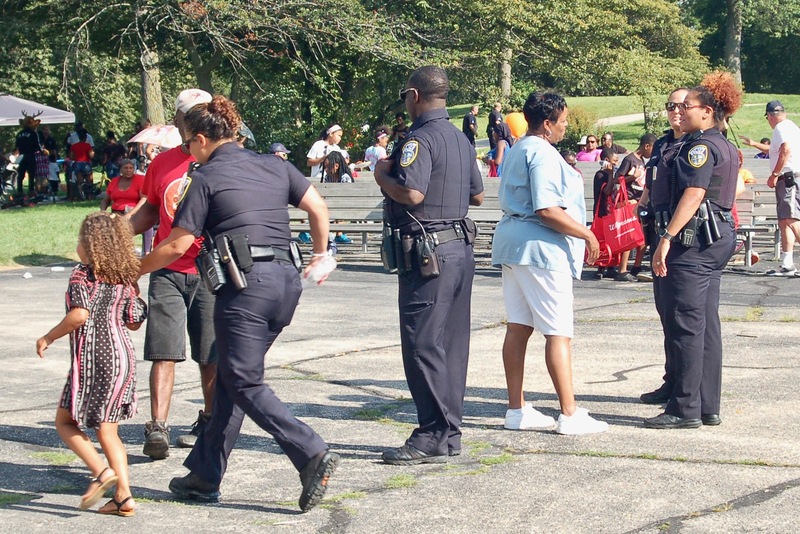 As children ran up a steep hill past resource booths and toward carnival games at last week’s National Night Out event in Washington Park, adult attendees approached Milwaukee Police Department Capt. Shunta Boston-Smith to give her handwritten notes. Featuring free food, live entertainment, raffles and carnival games, the event was sponsored by Jammin’ 98.3 and Metro PCS. Dozens of businesses and community groups, including Washington Park Partners, Running Rebels and Safe & Sound, contributed funding and volunteers. Washington Park is at the center of six neighborhoods in District 3, according to Boston-Smith. “Every officer here is volunteering their time to get to know community members and build relationships and trust. Our goal is to create a connection to the neighborhoods in District 3 so that we can work together to reduce crime,” Boston-Smith noted. Children dunked one another in the dunk tank as police officers chatted with community members standing in line for roasted corn on the cob. The Milwaukee Police Band played songs from the Disney hit film “Frozen” under the ivory bandshell as kids sang along. Milwaukee native Alex Robbins, 32, attended the event with his three nephews for the live entertainment and food, after hearing about it on the radio. “The atmosphere here is kid-friendly and very welcoming, but I worry about the times when we’re not all here to have a good time,” said Robbins. Robbins added that fellowship once a year is not enough to bridge a deep-rooted gap between the Milwaukee police and the community. “I want my nephews to grow up feeling like they can trust the police, but when we see shootings and brutality in the media it’s hard to think one day every year will change that. I really do not think it’s possible,” said Robbins. As an African-American woman, Boston-Smith said she understands the feelings of distrust, but her goal is to maintain contact with community members after the event to continue forming bonds. “One of the big raffles we have is a community block party. We plan to work with a specific neighborhood to bring the block party to life while strengthening the bond we already created at the event,” said Boston-Smith. Quellnya Cellars, who lives in MPD District 1, said she enjoyed the event, but expressed sentiments similar to those of Robbins. “The police are kind people who have families and are just like us; I know that. I just can’t fully believe that once we leave this park the comfort level will remain,” said Cellars. Cellars added that National Night Out is a great way to create a positive relationship between police and younger community members who do not hold an ingrained distrust. For Shomari Bratchett, 24, the first step to creating a relationship between Milwaukee Police and the surrounding community is honesty. “We can come to this event every year but until we are all honest about why there is this discomfort and mistrust we cannot fix anything,” said Bratchett. 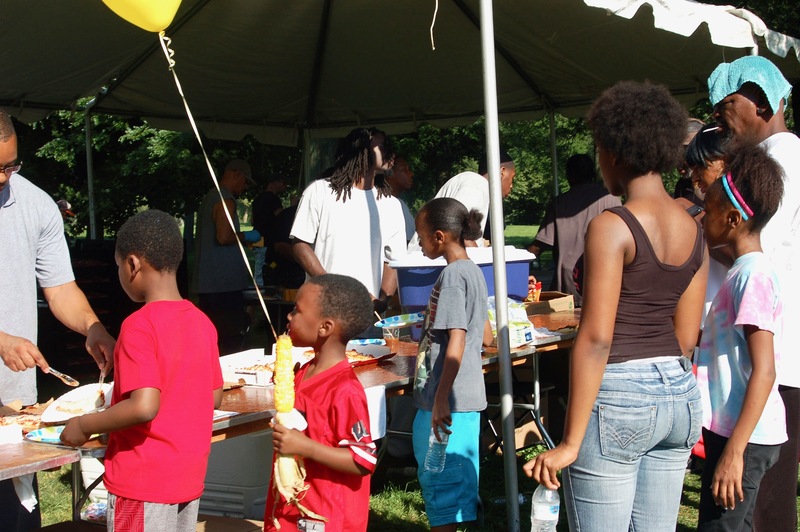 According to Boston-Smith, relating to community members in an open, honest manner is one of the main purposes of National Night Out. “Look, we can agree to disagree but that shouldn’t stop us from working together,” she said.